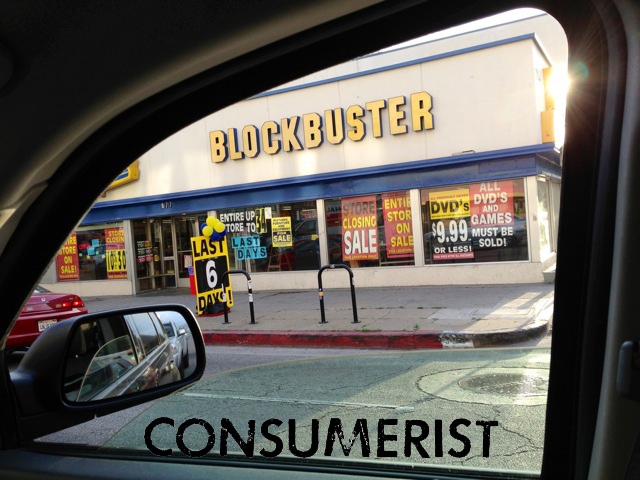 Times used to be, you wanted to have a scary movie night with your pals, you hop in the car and head to Blockbuster for a VHS and a bunch of Twizzlers. Those times are long gone, but this Los Angeles Blockbuster isn’t about to fade from the scene without a fight. Oh, no. It’s going down in a blaze of glory. By glory, we of course mean that this Blockbuster (spotted by Consumerist reader Peter in L.A.) is letting the entire world know exactly how many days left it has on this earth. As of this photo, six. There are six days left to get your kicks at the Blockbuster, in case you couldn’t tell from the eleventy billion “going out of business in six days!” signs. We asked Peter if he was tempted to go inside and check out what a dying dinosaur looks like from the inside, but alas, he said there’s no parking near it. And also?